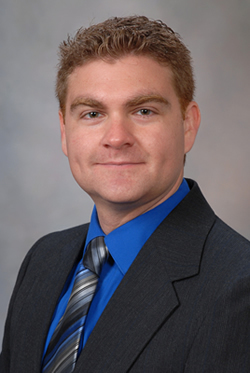 Dr. Ronald Butendieck is an Assistant Professor of Internal Medicine at the Mayo Clinic. He received his undergraduate degree of biochemistry and molecular biology at Rollins College in Winter Park, Florida and his Doctor of Medicine degree at the University Of Florida College Of Medicine. He then completed his Internal Medicine residency and his Rheumatology Fellowship at the Mayo Clinic. He is actively involved in teaching Internal Medicine Residents and Rheumatology Fellows at the Mayo Clinic and has received the Top Teacher in Rheumatology Award three times as a consultant at the Mayo Clinic. Dr. Butendieck has an interest in Behçet's disease and has presented on the topic of Neuro-Behçet's at the 16th International Conference on Behçet's Disease in Paris, France and the 56th Annual Australian Rheumatology Association Conference in Adelaide, Australia. He is the contributing author on the topic of Behçet's for the National Organization for Rare Disorders. He has also given numerous national and regional presentations and authored peer-reviewed articles and book chapters. Dr. Butendieck maintains membership in the American College of Rheumatology, American College of Physicians and the American Medical Association. In 2017, he was elected as a Fellow in the American College of Physicians. He currently serves on the Mayo International Health Program Selection Committee and the Humanities in Medicine Subcommittee.